The journey of the Vince Lombardi Trophy begins in the small New England town of Cumberland, R.I. Tucked away in the village of less than 40,000 is the workshop one of the world’s most renowned names in the jewelry industry, Tiffany & Co. The trip will end Super Bowl Sunday in Glendale when Commissioner Roger Goodell, amid streaming confetti and screaming fans, hands the trophy to either Seattle Seahawks owner Paul Allen or New England Patriots owner Robert Kraft. Another addition to their trophy case as the best in the business. After final polishing by Tiffany & Co., the trophy will be delivered from the Pro Football Hall of Fame in Canton, Ohio, where 250,000 fans have viewed it throughout the year, to the NFL Experience. It will be available for football enthusiasts to view from Jan. 24 until game day in the Phoenix Convention Center. The trophy, valued at more than $25,000, was locked in an armored case for its delivery to the desert. “The Tiffany for Business team oversees the transportation process and ensures that the trophy is given to the NFL with ample time before the Super Bowl,” said Vicky Reynolds, the chief spokeswoman for Tiffany & Co.
For the majority of fans, the trophy represents an identity, the crown jewel of the NFL and the focal point of the most iconic moment in American sports. 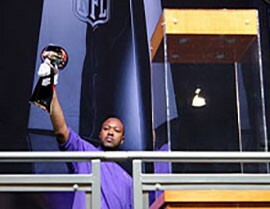 The trophy symbolizes the reward for the dedication demonstrated by the winning franchise and its fans. “To me, the trophy symbolizes excellence,” said Jon Kendle, an archivist for the Pro Football Hall of Fame. The relationship between Tiffany and the NFL began in 1967 with a simple sketch. The company’s former Co-Vice President Oscar Riedener sketched the trophy’s basic design during a meeting with Pete Rozelle, then commissioner of the NFL, said Reynolds. Tiffany & Co., also created the Pete Rozelle Trophy, presented to the MVP of the Super Bowl, as well as the NFL Pro Bowl Trophy. The company also molds the NFC and AFC Championship trophies. Legendary coach Vince Lombardi and the Green Bay Packers won the first two Super Bowls, then called the AFL-NFL World Championship. Following the death of Lombardi in 1970, Rozelle proposed the trophy be renamed the Vince Lombardi Trophy to NFL ownership. The NFL isn’t the only professional league that works with the famed jewelry company. Tiffany is also the creator of Major League Baseball’s World Series Trophy, NASCAR’s Sprint Cup Trophy and the NBA’s Larry O’Brien Trophy, awarded to the league’s champion. The appearance of the trophy itself has remained unchanged the last five decades. “The only thing I can think of is that the name engraved on it changes and the NFL logo has changed along with the Super Bowl Roman numerals,” Kendle said. For Super Bowl XLIX, the next engraving awaits. Super Bowl week is finally here and with it, the Vince Lombardi Trophy. Fans will get a chance to pose with one of the world's most coveted prizes throughout the week at the NFL Experience in the Phoenix Convention Center.